Mopar B & E Body. Mopar A Body 5x4.5. 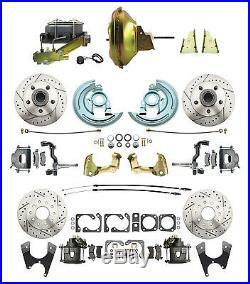 GM A, F, X Body Front & Rear 11 Power & Performance Disc Brake Conversion Kit. Front & Rear Non-Staggered Shock Disc Brake Conversion Package! ONLY FOR USE WITH 15 OR LARGER WHEELS! A- Body Chevelle/El Camino 64-72. This Package for Front & Rear Power Disc Brake Conversion Kit. 11&###xA0; Delco Moraine Stamped Power Brake Booster. Cast Iron Dual Reservoir Master Cylinder. Proportioning Valve w/ Connector Lines & Bracket. Performance Cross Drilled & Slotted 11 Rotors for Front & Rear. Loaded Large GM Front Calipers. Loaded Large GM Rear&###xA0; w/ Built in E-brake. All Necessary Brackets & Hardware. Backing Plates for Front (rear not included). Braided Stainless Steel Brake Hoses with Banjo Bolts. Bearings, Seals, Dust Caps, Spindle Nuts, Spindle Washers and all Hardware. ALL BRAND NEW & PARTS! More info about the front kit. The front GM A, F, X Body disc brake kit allows an easy solution to convert your drums to disc. Everything included in one kit. The spindles are stock height and will not change the ride height. Your rims need to be 15 or larger or the kit will not work. Disc brake conversions create offsets of 1/4" to 3/8" and in 99% does not affect the installation. More info about the rear kit. The Rear Disc Brake Conversion provides an easy to install, bolt on solution for upgrading your GM/Chevy 10 or 12 bolt rear-end to disc brake performance with built in emergency brake and cables! &###xA0;Works on C-Clip or non C-Clip rear ends. Each rotor is drilled for GM 5 x 4.75'' w/ 7/16'' stud bolt patterns. ALL NEW PARTS, NOTHING REBUILT OR REMAN! THIS KIT IS NOT FOR USE WITH Non-STAGGERED SHOCKS! IF YOU NEED A STAGGERED SHOCK KIT LET US KNOW AT CHECK OUT AND WE CAN SEND YOU ONE. Look how easy it is! Watch the video before purchasing. If you still have issues we offer Free. Tech support with your order. Pirate Jack Hot Rod Restoration is your one-stop-shop for quality disc brake conversions, brake boosters, master cylinders, and proportioning valves. We specialize in performance brakes for late fullsize GM cars from 1955-70 and muscle cars from 1962-74, Mopar, Chevy, & Ford. Pirate Jack also carries a full line of parts for Street Rods & Custom Built cars, including pedal assemblies, and hard to find power boosters, GM Restoration Parts, disc brake kits, and suspension products. Check out our tech page for information like how to test a brake booster, how to hook up a proportioning valve, how to plumb my brake lines, how to test my master cylinder and a F.
We give limited support on weekends and are available M-F 7:30-4:30 EST. Your order will be professionally and durably packed for its time in transit to you so we can give you the very best. In addition, you will receive a packing slip to check over your order. This listing is currently undergoing maintenance, we apologise for any inconvenience caused. The item "GM A, F, X Body Front & Rear 11 Power & Performance Disc Brake Conversion Kit" is in sale since Tuesday, March 10, 2015. This item is in the category "eBay Motors\Parts & Accessories\Car & Truck Parts\Brakes & Brake Parts\Discs, Rotors & Hardware". The seller is "pirate-jack-asheville-nc" and is located in Asheville, North Carolina. This item can be shipped to North, South, or Latin America, Australia, United Kingdom, Denmark, Romania, Slovakia, Bulgaria, Czech republic, Finland, Hungary, Latvia, Lithuania, Malta, Estonia, Greece, Portugal, Cyprus, Slovenia, Japan, China, Sweden, South Korea, Indonesia, Taiwan, South africa, Thailand, Belgium, France, Hong Kong, Ireland, Netherlands, Poland, Spain, Italy, Germany, Austria, New Zealand, Singapore, Switzerland, Norway, Saudi arabia, Ukraine, United arab emirates, Qatar, Kuwait, Bahrain, Croatia, Malaysia, Bangladesh, Brunei darussalam, Egypt, Iceland, Jordan, Cambodia, Sri lanka, Luxembourg, Monaco, Maldives, Oman, Pakistan, Reunion, Viet nam.